Audi RS6 C7 4.0 TFSI Remapping & Tuning - Our latest project car! After 3 years of ownership and some 75k miles covered we traded in the Audi RS6 C6 and took delivery of a brand new Audi RS6 C7 4.0 TFSI! After the C6 RS6 achieved a 217mph VMAX in Germany and proved a weapon around the Nürburgring the C7 RS6 had a tough act to follow. Still, despite dropping nearly 200bhp and 300Nm torque going from a tuned C6 RS6 to a stock C7 RS6 first impressions where good. The new ZF 8-speed auto offers tighter ratios initially whilst still being as long legged in the taller gears as the C6, making for good acceleration times. On our race-logic the C7 Audi RS6 managed 0-60mph in an impressive 3.6 seconds, some 0.3 seconds quicker than Audi's claimed 0-60 time! The C7 RS6 4.0 TFSI has so much more to give though and the development began! First and foremost we needed to get into the brain of the RS6 C7's ECU. 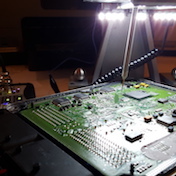 The ECU is a Bosch MED17.1.1 with a TC1797 CPU. This processor has 4MB of onboard flash memory, which contains all the code and maps required to run the RS6's 4.0 TFSI twin turbo engine. This is a very advanced control unit with many levels of torque control. The ECU was removed from our vehicle and placed onto our MagBench. This allowed us to take a complete dump of all the data on the ECU and the work began deciphering exactly how this ECU and engine operates. This is crucial to developing both a high performance, but more importantly, a safe remap for such a complicated ECU and engine as the 4.0 TFSI found in the C7 Audi RS6. Having read the factory ECU successfully we now had a complete dump of all the code and maps on the RS6 ECU. Now this may look confusing to the uninitiated, but there is logic in there we promise! Work began carefully deciphering what each bit of code does and naming each block of data so it can be referred back to later. 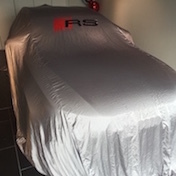 This can be a long and painful process, but its why our customers now trust us with £100k of Audi RS6 C7. This isn't a stab in the dark remap, but properly conducted development over a series of weeks. After many long nights we had a clear picture of exactly what the RS6 C7 ECU was doing, why it was doing it, how we could improve it and would begin developing a tune. Adjustments where made to torque control, ignition timing, load requests, torque requests, torque limiters, over-boost conditions, pressure limiters and load limiters just to name a few. The modified file was then ready to be loaded onto our C7 RS6 for testing. Extensive data logging was carried out to ensure everything we had hoped for in software was being seen in practice. Everything was exactly how we expected and the car made some good dyno pulls to verify our figures. The remapped runs produced 700bhp and 1032Nm torque! It's also easy to make peak numbers briefly, but we where pleased to see our tune holding near peak horsepower from 5100rpm right through to the redline. 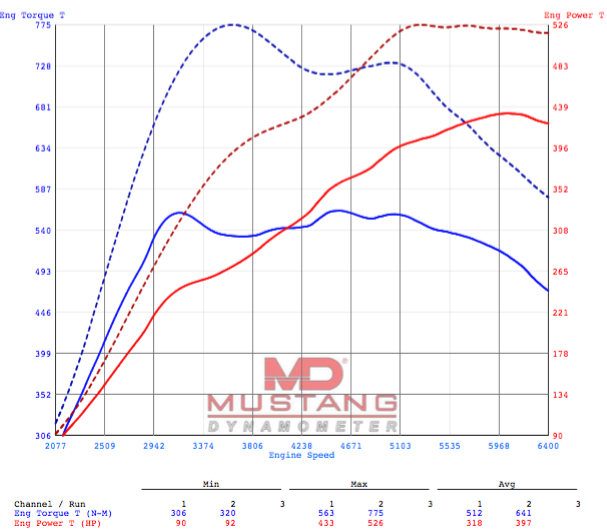 The graph below shows the original stock runs performed on the C7 RS6 in solid and the tuned runs with the dotted lines. Red lines are horsepower, blue lines are torque. Please note, despite contrary belief all chassis dyno's measure wheel horsepower and as a result this graph is in wheel horsepower. Many dyno centres decide to 'correct' their graphs to show engine or flywheel power, however this is an easy way for readings to get inflated. In a bid to be totally transparent, here we are posting raw wheel horsepower numbers and we will explain the math behind them below the graph. All dyno's measure differently and different strapping methods, tyres and wheel weights can all effect the wheel horsepower a dynometer reads so these tests and figures need to be done back to back on the same dyno. As a result the car was loaded with stock software, and our newly developed RS6 C7 remap on the same day and on the same dyno. Initially 433whp seemed very strong for the C7 RS6. The drivetrain is similar to the C6 RS6 which by comparison laid down 370whp stock. This gave the C6 RS6 a transmission loss of 31%, which in our experience isn't unusual for a Quattro Audi drivetrain. Given the new ZF8 speed gearbox is sold as more efficient, and certain ancillaries in the C7 RS6 are demand based such as the alternator, we can safely assume a higher WHP number is to be expected. 552bhp (stock Audi claimed) minus 21% = 436whp, so we could assume a 21% drive-train loss on the C7 RS6. We don't however believe this to be the case. The hugely fast stock 0-60 times, along with a lot of the stock maps found inside the RS6 C7 ECU lead us to believe the RS6 C7 is actually up on power stock and under quoted by Audi. This view is also widely accepted by many other tuners. As a result we concluded whilst the C7 RS6 does have a more efficient drive-train than the C6 RS6, a figure of 25% is more realistic, giving a STOCK power reading at the engine of 577bhp. Using this same formula our tune calculates out at 700bhp and 1032Nm torque! Pretty awesome! Real World RS6 C7 Performance Testing! Remember the STOCK RS6 C7 0-60mph time of 3.6 seconds we managed to achieve? Here's the post-tuned result running our performance remap... 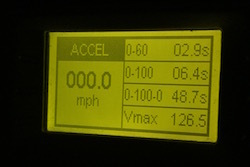 Yes, you read that correctly... 0-60mph in 2.9 seconds in a large 4 wheel drive estate car! The RS6 C7 then went on to hit 100mph in just 6.4 seconds!